So said Herbert Simon, an early artificial intelligence researcher, in 1965. "...I don't believe that predicting the future is really what we're about. After all, we ourselves, or at least the younger ones among us, are going to be a part of the future. So, being a part of the future, our task isn't to predict it. It is to design it..."
A lifelong student of how people make decisions, Simon, 84, has focused on how people use rules of thumb. These mental shortcuts depend on our ability to recognize patterns and associate them with things we have previously experienced. They are essential, he observes, because people rarely have all the time and knowledge necessary to rationally assess situations. It's an idea at the basis of "bounded rationality" -- the theory that won him the Nobel Prize in economics in 1978. While conventional economists maintained that people make rational choices to obtain the best commodity at the best price, Simon argued that inevitable limits on knowledge and analytical ability force people to choose the first option that "satisfices" or is good enough for them, whether they are buying a loaf or bread or choosing a spouse. In pursuing these ideas, Simon followed his own rules of thumb. He began as a political scientist, studying how parks department budgets were made in his native Milwaukee, which led him into economics and business administration. At Carnegie Tech in the mid-1950s, he and Allen Newell incorporated a new tool -- the computer -- into the study of decision making. In the process, they invented the first thinking machine and a field that would become known as artificial intelligence. Simon's continuing interest in how people think landed him in Carnegie Mellon University's psychology department, where he continues his pursuit of cognitive science. The potential of computers to make the world a better place or to create problems will be discussed by experts in psychology, artificial intelligence and the arts during a day-long symposium Thursday at Carnegie Mellon University. Q: Do you consider your Nobel work on bounded rationality to be your most significant contribution to science? A: Not specifically that, but it really is very closely related to the work I do in computer science. I like to think that since I was about 19 I have studied human decision making and problem solving. Bounded rationality was the economics part of that. When computers came along, I felt for the first time that I had the proper tools for the kind of theoretical work I wanted to do. So I moved over to that and that got me into psychology. Q: So you have moved from field to field as you could bring new tools to bear on your study of decision making? A: I started off thinking that maybe the social sciences ought to have the kinds of mathematics that the natural sciences had. That works a little bit in economics because they talk about costs, prices and quantities of goods. But it doesn't work a darn for the other social sciences; you lose most of the content when you translate them to numbers. So when the computer came along -- and more particularly, when I understood that a computer is not a number cruncher, but a general system for dealing with patterns of any type -- I realized that you could formulate theories about human and social phenomena in language and pictures and whatever you wanted on the computer and you didn't have to go through this straitjacket of adding a lot of numbers. That seemed to me a tremendous breakthrough. And one of the first rules of science is if somebody delivers a secret weapon to you, you better use it. I've spent a good deal of my last 20 years looking at decision making and problem solving involved in scientific discovery. We took major historical scientific discoveries and we said what would it take to write a computer program that, given no more information than the guy who made the discovery had, would make the same discovery? Herbert Simon is the man with the golden thumb. Symposium to explore computers' potentialThe potential of computers to make the world a better place or to create problems will be discussed by experts in psychology, artificial intelligence and the arts during a day-long symposium Thursday at Carnegie Mellon University. The symposium marks the dedication of Newell-Simon Hall, which is named in honor of Nobel laureate Herbert Simon and the late Allen Newell, winner of the National Medal of Science. The pair were pioneers in artificial intelligence and cognitive psychology and played key roles in developing Carnegie Mellon's computer science program. The speakers at the symposium, "Earthware: A Good World in 2050. Will Computers Help or Hinder? ", include Raymond Kurzweil, a leading authority on artificial intelligence; David Gelertner, a Yale University computer scientist who was injured in 1993 by one of the explosive packages mailed by Unabomber Ted Kaczynski; and Alex Singer, a director of "Star Trek" and other film and television programs. Speakers from CMU include robotics visionary Hans Moravec, Internet sociologist Robert Kraut and former computer science dean Raj Reddy. Bill Joy, a co-founder of Sun Microsystems who has warned that genetic engineering, nanotechnology and robotics could pose a threat to mankind, will appear in a "synethic interview," a technology developed at CMU that allows a person's videotaped remarks to be replayed in response to live questions. 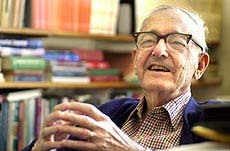 An interview of science fiction author Arthur C. Clarke, taped at his home in Sri Lanka, also will be presented. Simon will present a concluding talk. The symposium begins at 8:45 a.m. Thursday in University Center's McConomy Auditorium and will conclude with the dedication of Newell-Simon Hall at 5 p.m. The program, which includes lunch, is free to members of the Carnegie Mellon community and $30 for non-campus attendees. For information, call 412-268-8525. Simon and the late Newell are the namesakes of the university's newest building, Newell-Simon Hall, which houses computer science offices. Dedication of the $20 million, four-story structure will be marked Thursday by a scientific symposium, "Earthware: A Good World in 2050. Will Computers Help or Hinder? ", in University Center. Last Wednesday, the day when this year's Nobel in economics was awarded to Americans James Heckman and Daniel McFadden, Simon sat down with Science Editor Byron Spice to discuss the nature of scientific discovery and his thoughts about how technology will affect humans in the coming decades. Do you consider your Nobel work on bounded rationality to be your most significant contribution to science? Q: In 1957, you made the famous prediction that a computer would be the world chess champion within 10 years. [IBM's Deep Blue wouldn't beat the human champ until 1997] Do you have a guess when a computer will make a Nobel-worthy discovery? A: I'm pausing to think if that's already happened. We focused on 19th century physics and chemistry. So, for example, we said [17th century mathematician Johannes] Kepler had some data, then available to all astronomers, on the distances of the planets from the sun and the periods of their revolution around the sun. He had that for the five inner most planets. And he started to do whatever he did, and after a while he decided that the periods went up with the square of the distances. And he published that. The fit isn't very good. So 10 years later, he went back to it. In a couple of months, he said, oh, the period really goes up as a three-halves power of the distance, [the square of the orbital periods are proportional to the cube of their distances from the sun]. That gives you a great fit, so great that we still accept the law, [Kepler's third law of planetary motion]. So we had a little computer program called BACON, named after Sir Francis, and all we gave it were those five data points --five distances and the corresponding periods. And we said to BACON, see if you can find a pattern there. And in a couple of seconds, BACON had it. So, what did BACON do? Did it try out all possible functions? Well, that's nonsense. No, in fact it got it on the third or fourth try. Well, Kepler certainly would have gotten a Nobel prize. What about the computer? It didn't know anything Kepler didn't know. So evidently, it had to have similar power. And it didn't do it by brute computer strength. It had a way of generating patterns, it makes a try, it compares the try with reality and then makes an adjustment. Q: So a computer could someday deserve a Nobel? A: I see no deep reason why not. We already have a world champion chess player, though that one I would not claim does it in a humanoid way, although it certainly does not do it by brute force. It uses a combination of computer speed and just a load of chess knowledge. But forget about Nobel prizes; they aren't really very important. One of my former students, Raul Valdes-Perez [a CMU senior research computer scientist] wrote a program called MECHEM. You give it what you know about the inputs and outputs of a chemical reaction but you don't know how the reaction comes about. You ask MECHEM for hypotheses about that reaction and it will give you a set of hypotheses [listing potential steps the reaction may follow]. Its ideas are interesting enough so that its results on several occasions have been published in chemical journals. Q: Can computers help people act more rationally? A: Anything that gives us new knowledge gives us an opportunity to be more rational. Human knowledge has been changing from the word go and people in certain respects behave more rationally than they did when they didn't have it. They spend less time doing rain dances and more time seeding clouds. But the big thing we have learned is that humans are very good at learning about a lot of patterns that show up in the world and associating what they know about the world with them. It's what a doctor does. He learns what measles looks like so that he can call it measles -- preferably in Latin, though -- and then get access to all that information in his [mental] encyclopedia. We know people are good at searching for things very selectively, that is, using various rules of thumb to narrow down their searches. One of my big interests has been to see how we can give computers those capabilities. Because I don't care how big and fast computers are, they're not as big and fast as the world. Q: This week's symposium addresses whether computers will help or hinder efforts to create a "good world." Does that assume a technology can be inherently good or bad? A: No, not inherently -- inevitably. (Laughs). There are no morals about technology at all. Technology expands our ways of thinking about things, expands our ways of doing things. If we're bad people we use technology for bad purposes and if we're good people we use it for good purposes. That's why I'm less interested in questions of forecasting and more interested in what kinds of decisions we can make so that we do get a positive balance of the good uses of technology. Q: So what kinds of decisions can we make to achieve that positive balance? A: Well, first of all, we can do some thinking about what would be a sustainable and acceptable world. Notice I don't say the best of all possible worlds. I wouldn't know how to define it. Simon's name goes on new hallNewell-Simon Hall could be called the building that Lycos built. The $20 million building project was funded largely by Carnegie Mellon University's sale of stock in Lycos Inc., the company founded by CMU researcher Michael Mauldin, who developed the Lycos search engine for the Internet. The project added two stories to two existing buildings -- including the Field Robotics Center -- and connected them together under a single roof with a central atrium. The resulting four-story building encloses 42,000 square feet of renovated space and 65,000 square feet of new space. The building houses elements of the School of Computer Science, including the Robotics Institute, the Language Technologies Institute and the Human-Computer Interaction Institute. Q: A good enough world? A: Yeah, a good enough world -- a satisficing world is my favorite term. And when you begin to think about that, you don't begin by thinking about machines, you think about people in the world. And you decide, well, maybe we better get a world in which we have the resources to keep it going. Maybe we ought to have a world in which things are divided between people kind of fairly. And then we ask how do we get there? Well, almost any way of getting there involves knowing a lot about the world and how it works. That's a major place where computers come in. They can help us think. Q: This week's symposium will address some of the ideas of Bill Joy of Sun Microsystems, who says that the combination of genetic engineering, nanotechnology and robotics could create a future in which humans may become expendable. Do you share his concerns about these technologies? A: Oh, I think they can cause enormous harm. Imagine them in the hands of a group of people who happened to have power and thought they were the hero race. But notice how I put it -- think of them in the hands ofpeople. Again, it's ourselves who are in the center of all this and need to be in the center of our thinking. Q: If computers can think for themselves, do people become expendable? A: Computers thinking don't make you expendable. I think the real worry is, does this destroy what's valuable or precious about human beings? And that derives in turn from some idea that to be valuable you have to have a unique property -- you have to be different in some respect -- and that when anybody threatens human difference, whether it's Darwin or Galileo or whoever, there's a very strong reaction. I think the mistake is in basing one's claim to worth on uniqueness. Most of us really aren't horribly unique. There are 6 billion of us. Put 'em all in one room and very few would stand out as individuals. So maybe we ought to think of worth in terms of our ability to get along as a part of nature, rather than being the lords over nature. Q: Will machines find us expendable? A: Well, expendability is a slightly different question. What happens at the time when they can make all the things we want to have made or can afford to have made within the earth's capacity? What do we do about it? Well, first we ought to understand how human beings behave under those circumstances. There are plenty of historical examples. In every slave civilization there have been a group of people who didn't have to work for a living. So what did they do to make life significant for themselves? A few of them found very ingenious things to do that really excited them and kept them busy and the fact that they didn't have to do them never bothered them. Science, in England at least, was a gentleman's game as late as the 18th century and some people found it kept them very happy. And then there are some who focused on the usual verities of life -- family, home, relations with other people -- and when you look at the upper classes of those societies they were about as happy or unhappy as people usually are. Some extravagantly happy, some extravagantly unhappy. So we're going to have to think about how you grow people up who find exciting things to do when there's nothing that has to be done. We're dangerously close to that for half of our society right now. But here again, you see, technology may create a condition, but the questions are what do we do about ourselves. We better understand ourselves pretty clearly and we better find ways to like ourselves. Q: So, in the next 50 years, we have the potential to create our own utopia or our own hell? A: More likely a bit of both. Lewis Carroll, “What the Tortoise Said to Achilles', Mind 4, 1895, 278–280. 7 Cited in note 5. ... say “best” here. Herbert Simon observes 126 GILBERT HAR MAN. Apr 26, 2013 - So said Herbert Simon, an early artificial intelligence researcher, in 1965. ... RT @pickover: Lewis Carroll's typewriter, acquired by him in 1888. Apr 16, 2011 - There are no simple conclusions about Lewis Carroll's photos of Alice. "Peak: Secrets from the New Science of Expertise"